‘Free Fillable Forms’ For 2013: 3 Tips To Get The Built-In eFile Feature To Cooperate. >> 2013 ‘Free Fillable Forms’ Form 8949 ‘various’ — Mar. 7, 2014. Free Fillable Forms (FFF) has always had (ever since I started using it, with much gratitude a few years ago) a built-in eFile feature, replete with an ETF function for paying any additional taxes you may end up owing. The eFile, as with everything else with FFF, works, and works well, but it can be a tad finicky — and unlike with the rest of FFF there aren’t good instructions to tell you why it is PRECLUDING you from filing. FFF will NOT let you eFile until it is satisfied that you have completed all the steps in the eFile section. And that is where things get finicky … because FFF does NOT tell you exactly why it is precluding you from hitting the “eFile NOW” button. Basically unless you can get FFF to light-up the “eFile NOW” button you are stuck. You cannot manually turn it on or circumvent it. Your only option, if you can’t get it to light-up, is to print the forms and mail it in! Here are 3 pointers I have learned over the year that might help you. 1. IF you owe money and have to authorize an ETF make sure that the date you specify as to when the funds should be withdrawn from you bank is AT LEAST two days hence! This one is crazy. If you ask for it to take the money out on that day itself, FFF will not light-up the magic button. I learned this via trial-and-error. I knew that everything else was beyond copesetic because I had quadruple checked it. But the button was not lit. It had been lit BEFORE I started entering the ETF data. So, I knew that my problem was in the ETF section. Obviously FFF can’t check whether my routing code (other than having the right number of digits) or my bank account number are correct. So the ONLY variable was the “withdraw monies on this day” field. I had assumed, as is the case with other systems, that if you put “today’s” date it will understand that it means “as of now”. Not so. As soon as I changed that date to 3 days hence, the button lit-up and Bob was my uncle. 2. In the signature section, BUT not in the IDENTIFICATION section, you make up your own PINs. They don’t explain that well enough. 3. Make sure you get all of your ‘Federal Tax Withheld‘ correct from all the W-2, 1099s etc. IF you don’t all hell breaks loose. They have got better about this BUT having run foul of this a few years ago I now check this about 600 times before I submit. OK. So this is just to help you IF you run into the issue of FFF refusing, stubbornly, to light-up the ‘eFile now’ button. 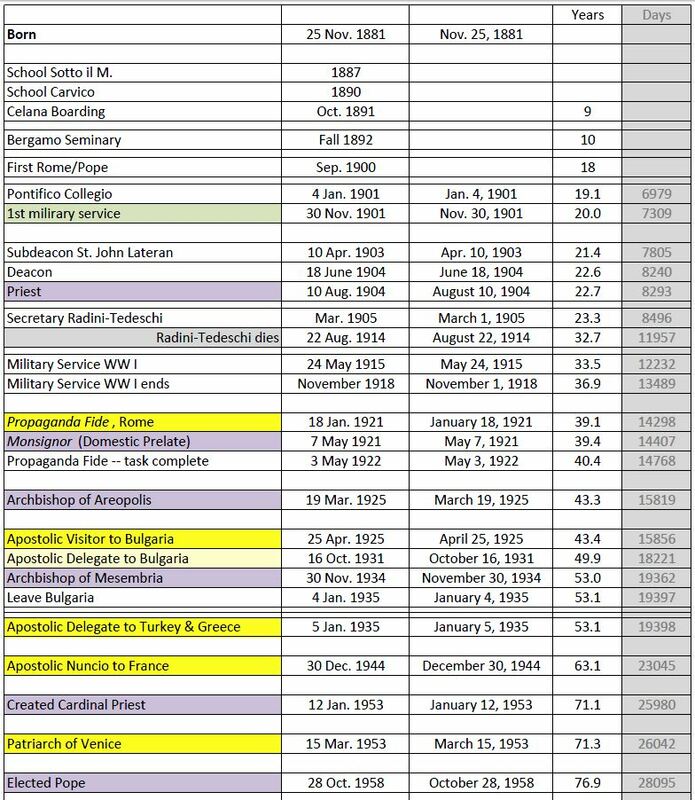 Blessed Pope John XXIII — The Timeline Of His Life With The Key Events. Click to ENLARGE. This is a screenshot of an Excel spreadsheet I created. 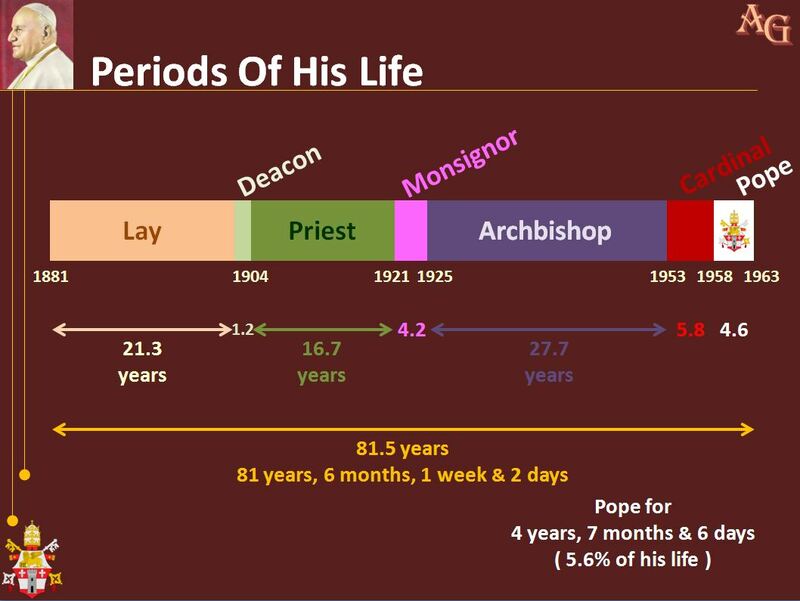 I used this to make sure that the timeline shown above is accurate in terms of the length spans used to denote the various phases of his life. Use the link below if you want this as a 1-page PDF. 1. Sunday, April 13, 2014: 3 p.m. at the Taylor Community in Laconia. Open to the public. 2. Thursday, April 17, 2014: 7 p.m. at the New Durham Library. 3. Tuesday, April 22, 2014: 7 p.m. at the Alton Gilman Library. So I started putting together a PowerPoint presentation. The top image is the 1st of a series of animated slides I will use. Thought some of you may like having the timeline. I will publish the whole presentation when it is done. Louisiana Court Decision That “Buddhism Is NOT Stupid” Greeted With Glee By Sri Lankan Buddhists. >> — Jan. 26, 2014. >> Is Buddhism a religion? Click to access original from “care2.com” OR Google “Louisiana Buddhist” for plenty of others. I talked about this in January when the news broke and even pointed out how it is possible to easily be a good Buddhist while at the same time semi-embracing Christianity (or any other religion) without in anyway being in conflict let alone violation. That a judge would deem the act of anybody associated with a public school, even in Bible-Belt Louisiana, calling a religion ‘stupid’ unlawful was a given. I think most U.S. folks knew that this would be the outcome of this case. That was clear cut. But, I am glad the Sri Lankan Buddhists are so delighted with the ruling. I read about 4 articles and could only find one passing reference to the monetary damages awarded to the parents. From what I could see they were awarded $4,000 to cover their transportation costs for driving their kids to another school — and the school district that was sued ordered to provide them, for free, bus transportation to the new school in future. All of what the school was told to comply with, in future, in terms of what they say and do about religion, goes without saying was the standard American “motherhood and apple pie” creed when it comes to religion in school. As far as I am concerned, and as I did say in January, this misguided and obviously very insecure teacher should be fired not for calling Buddhism stupid BUT for her inexcusable and extremely ignorant (even by the low-standards of Louisiana) use of excessive exclamation points. (See image above.) To be that was the most egregious of her faults. My god. So many exclamation points. She really should be fired for that or, at a minimum, forced to attend one-year of College to learn English. As for the parents, as I also did say in January, they need to better educate their children about Buddhism — especially when it comes to the Buddhist concept of creation, or more to the point, lack thereof. Yes, I have finally started working on a book on Buddhism. When it is published it will definitely help people see Buddhism in a different light — the way I was taught to appreciate Buddhism. Malaysian Airlines MH370 Conspiracy: After 17 Days THEY Can’t Wait A Few Hours To Confirm Debris! This Is Beyond The Pale. Click to access the U.K. “The Telegraph” original. After 17 days of obfuscation, deceit, disinformation and incompetence THEY make a final, ‘definitive’ determination JUST as ships are TRYING to recover the supposed debris? After 17 days THEY could not have waited another 2 hours to see if the debris can be categorically identified? Why is China and France the main providers of satellite data and interpretation? Isn’t the U.S. the global leader, head and shoulders above all, when it comes to ALL satellite capability and competence? So why is the U.S. so quiet in this — especially given that Boeing definitely has skin, quite literally, in this game. Looks like THEY just want to close the case and call it quits. As a professional cynic I do not buy this. I want to see proof from the recovered debris.